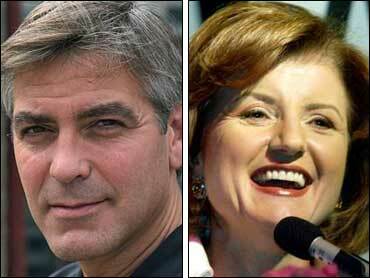 Commentator Ariana Huffington apologized to readers for a blog posted on her Web site, The Huffington Post, on March 13 that was attributed to actor George Clooney but was actually a compilation of his views. Huffington acknowledged on her Web site Saturday that she was "blinded" to the issue of assembling a blog in which the source of the material wasn't clear, as was the case with Clooney. "I now realize that I made a big mistake in posting a blog without clearly identifying that the material in it didn't originate as a blog post, but was pieced together from previous interviews," she wrote. "I'm sorry I didn't see this earlier." Last week, Clooney issued a statement denying he wrote the blog, saying he only gave Huffington permission to use a compilation of his critiques of the Iraq war from interviews with Larry King and London's The Guardian. On Monday, Huffington said she considered the misunderstanding a "major lesson learned" and would put future snippets from interviews or conversations into her own blog. She also maintained that while she sent Clooney a sample blog "to show how it's done and encourage him to join the blogosphere, I will curb my enthusiasm and not do this in the future." Clooney's publicist Stan Rosenfield wasn't entirely satisfied. "She didn't apologize to George, did she?" he said Tuesday. "An apology to the readers was appropriate. But to my knowledge, she has not apologized to George." Clooney's comments in the profanity-filled posting, criticize Democrats for muting their views and criticism of the Bush administration in the months before the start of the Iraq war.